What does your tennis technique say about you? By Peninsula Sports Medicine Group|June 1, 2015|Latest News, Tennis|Comments Off on What does your tennis technique say about you? Have you ever wondered how the big names like Federer and Djokovic get as much power as they do and make it look so easy? Lachlan Hough, Physiotherapist from our Rosebud Clinic tells us how. The answer of course, is technique and timing. What you may not know, is that whilst working on your technique can improve your game, it also reduced the likelihood of you getting pain and frustrating injuries like ‘tennis elbow’and tears of the ‘rotator cuff’ in the shoulder. HOW CAN YOU AVOID INJURY ON THE COURT? The benefit of having sound timing and good footwork is easy power. By shifting your weight forwards through the shot and hitting the ball on the rise, you rely far less in your racquet arm to create power. Instead you use your opponent’s power against them. Less reliance on your shoulder, elbow and wrist to create power means less chance of injury. If you have had tennis lessons, you know coaches love this catch cry. Bending you knees does not just help you get down to that low ball, it also forms the first link in a crucial chain of movement. The ‘kinetic chain’ is the sequence in which the different parts of your swing combine to generate power. 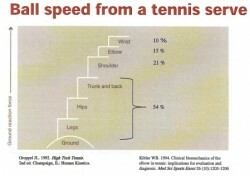 For example, in the serve, the most power should come from the largest muscles. Starting from the ground up by bending the knees, then powerfully launching upwards extending the knees and hips, rotating through the trunk, before finally throwing the racquet upwards and forwards to connect with the ball. If even one link in the chain is faulty or insufficient, it results in a ‘catch up’ effect, where the later segments of the chain try to compensate. Playing catch up almost always eventually leads to injury with repeated excess strain on the elbow and shoulder in particular. Tennis racquets are bigger and heavier than the squash equivalent. 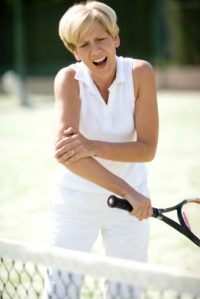 Adopting a technique of slapping or swatting the ball using the wrist and elbow results in excess stress on forearm muscles leading to painful and often persistent tennis elbow. The odd squash shot is good for getting out of trouble but use too often at your own peril. In particular, be careful to maintain a strong wrist position on that classy single handed backhand to avoid elbow injuries. A droopy wrist is no good for your shot, or your elbow. Your coach is an expert in all things tennis. At your next lesson, ask your coach to closely assess your technique, particularly the serve. You may just fix an issue before it becomes a problem. If you’re injured on the court, then a visit to your physiotherapy for treatment and advice will allow you to have a quicker road to recovery and be back on the court faster. If you can, take a short video of your serve/forehand/backhand and bring it in to your appointment when you’re nearing a return to play. It may just help to design a tailored strengthening program to improve the parts of your swing that you need most!